Although it still feels like summer, and we still eat outside when it’s sunny enough, fall is definitely here – back to school time makes me crave those classic dishes from my childhood: shepherds’ pie, chili, classy chicken, and spaghetti loaded with sauce. When we start getting back into the groove of fall schedules, I like to make a habit of preparing twice (or more) as much dinner as we need, and freezing the surplus for an almost instant dinner on another night. A classic bolognese is the perfect candidate for the freezer – and makes use of fall veggies in season, like garlic, zucchini, tomatoes and peppers, if you’re inclined to add any. 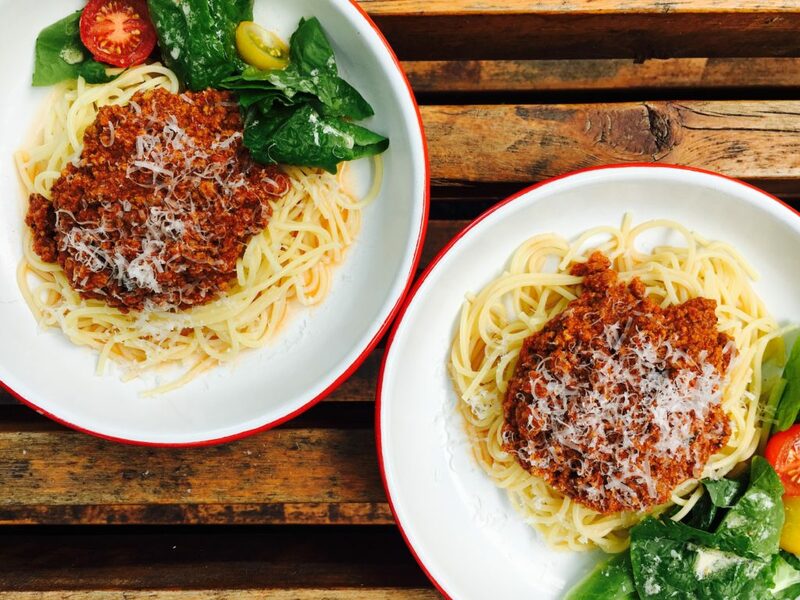 Or roughly chop a bunch of veggies and skip the meat altogether for a vegetarian bolognese. This recipe is fairly small, but can be doubled or even tripled for a larger batch – or bulk it up with extra veggies and tomatoes. Often when I have overripe tomatoes I’ll toss them in the freezer whole, then add them to sauces later. In a large, deep skillet, sauté the onion, carrot, celery, garlic and bacon in the olive oil for about 10 minutes, until the vegetables are tender. Add the ground beef and cook, stirring and breaking up the lumps of meat until no traces of pink remain. Add a splash of wine if you like, and cook until the liquid evaporates. Crush the tomatoes with a fork and add them along with the balsamic vinegar. Reduce the heat to a simmer and cook for half an hour to an hour, stirring occasionally, until the sauce has thickened. Add the basil leaves and salt and pepper to taste, stir in the half & half and simmer for another 15 minutes. Serve over pasta with grated Parmesan cheese at the table. Serves 4-6. Posted in Pasta, Recipes and tagged dinner, pasta, recipes.